Director Eva Aridjis' 2007 documentary La Santa Muerte: Saint Death is a measured, elegiac meditation on the passionately dedicated Mexican followers of the cult of Santa Muerte. A syncretic belief system combining pre-Columbian indigenous religions and mainstream Christianity, the cult centers around the skeletal female embodiment of death and has over 2 million disciples across Mexico. The practice's origins are shrouded in mystery: some say it originated in Hidalgo during the 1960s, while others maintain the cult's existence spans hundreds of years. 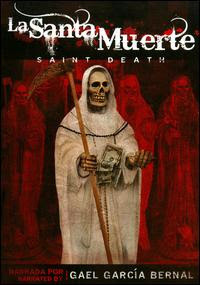 Nevertheless, Santa Muerte's presence continues to inspire many. Narrated by famed Mexican actor/director Gael Garcia Bernal, the film neither lauds nor condemns the followers of Saint Death, but reveals the hope and strength disparate people gain through worshipping her. Aridjis focuses particularly on how the disenfranchized and marginalized have a special connection with Santa Muerte. From men and women in prison to gays, transsexuals, gang members, and the sick and impoverished, Santa Muerte reaches a cross-section of Mexican people that the Catholic Church cannot. While critics find the practice satanic in nature, the benefits to those who have stared with reverence into her imposing hollowed eyes is evident. Some included in the documentary describe in vivid detail how she saved them from certain death, while others assert that their addictions were cured and they achieved inner peace through paying tribute to Santa Muerte. As a young man sporting a Ramones shirt and a Doors visor explains, "I feel she is a miracle worker and she doesn't discriminate." Interviews, pilgrimage footage, festival shots, and haunting guitar driven folk music come together through Aridjis' artful eye to create a vision of Santa Muerte's powerful hold on her devotees. Enjoy the trailer of the work below, or rent the subtitled version from Netflix. haha us cholos are so effin crazy.